Nelson Mandela, South Africa's first elected black president and a global anti-apartheid icon died early Friday, at his home in the suburb of Houghton in Johannesburg, following a lengthy illness. He was 95. The elder statesman was receiving medical care from a leading team since September after spending three months in a Pretoria hospital for a recurrent lung ailment. "Fellow South Africans, our beloved Nelson Rolihlahla Mandela, the founding president of our democratic nation, has departed," Zuma said in a nationally televised address. He passed away peacefully at 20:50 (local time), 5th December, Zuma said. "He is now resting. He is now at peace...Our nation has lost its greatest son. Our people have lost a father," he said. Zuma announced that there would be a state funeral for the departed world leader. Details of the funeral have not been announced yet, but all flags will fly at half-mast until the funeral. Zuma said Mandela's tireless struggle for freedom earned him the respect of the world, "His humility, his compassion, and his humanity earned him their love." 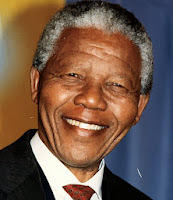 "Our thoughts are with the South African people who today mourn the loss of the one person who, more than any other, came to embody their sense of a common nationhood.